Cooking dinner for two can often prove to be a difficult task. So many recipes are geared toward larger families, yielding four or more servings per recipe. The ones that are “conveniently” designed for two call for just half of a can of this, or a quarter of a package of that… What am I supposed to make with that half used can of garbanzo beans and ¾ package of taco seasoning tomorrow?? So I am always on the lookout for recipes that actually are convenient for two, or ones that can easily be adapted. The recipe below, which I found in the “Recipes for Health” section of the New York Times, fits that bill. It yields two huge creamy-but-still-light bowls of soup (or four large appetizer size portions) and is a wonderfully satisfying meal on a spring or summer night. If you are like me, you may be wrinkling your nose at the thought of an entire bulb of garlic in two bowls of soup. I am all for garlic, but a whole bulb seems excessive, no? But when I looked closer, I noticed that the recipe didn’t call for just any old garlic, it specifically called for spring garlic. I had never heard of spring garlic, so I did some digging. From a quick Google search, I learned that spring garlic, also known as green garlic or baby garlic, is garlic that is harvested before it has matured. It looks very similar to green onion, with white bulbs and green stalks, and is harvested in the same way. (See the picture to the left from Summer Tomato.) It has a very mild garlic fragrance and flavor. Since it only sprouts during the spring, green garlic is available for a small window of time each year. The best place to find it is at a local farmers market or natural foods store. The two natural food stores near my apartment did not have any in stock, so instead I bought a bunch of green onions (aka scallions), and added two sliced cloves of regular garlic to the recipe as well. 1. Break off the woody ends of the asparagus stalks and combine them with the stock and the green garlic (or, in my case, the garlic cloves and green onion) in a soup pot and bring to a simmer. Simmer 15 minutes. 2. Using a skimmer, tongs, or a slotted spoon, remove the asparagus stems and discard. Season the broth to taste with salt and pepper. 3. Slice the remaining asparagus into 1-inch pieces and add to the broth. Simmer 8 to 12 to minutes. It should be very tender and fragrant, but still bright green and not mushy. 5. Ladle soup into bowls and serve with a spoonful of pasta, rice, or other grain in each bowl if desired. 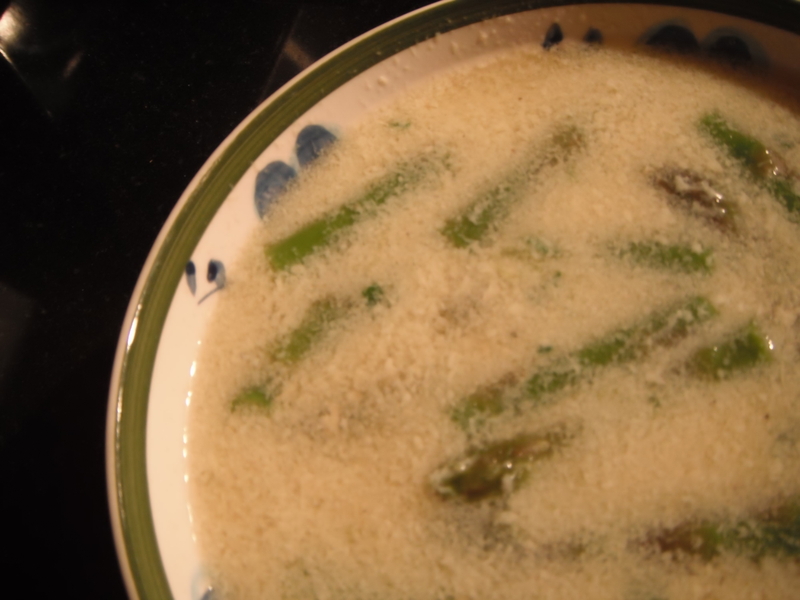 The result was a light, creamy and delicious asparagus soup with just a hint of onion and garlic. To make it a more substantial dish, I added ½ cup of quinoa for a protein boost. I’d love to try this recipe again when I can find green garlic. I would definitely suggest this soup for an easy spring or summer meal.